We have seen an exponential growth in the use of Artificial Intelligence (AI) over last few years. AI is becoming the new electricity and is touching every industry from retail to manufacturing to healthcare to entertainment. Within AI, were seeing a particular growth in Machine Learning (ML) and Deep Learning (DL) applications. ML is all about learning relationships from labeled (Supervised) or unlabeled data (Unsupervised). DL has many layers of learning and can extract patterns from unstructured data like images, video, audio, etc. 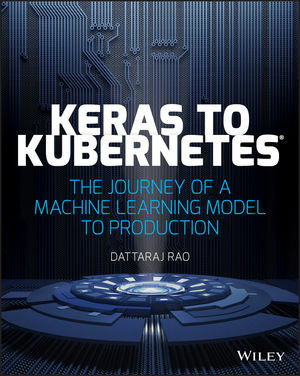 Keras to Kubernetes: The Journey of a Machine Learning Model to Production takes you through real-world examples of building DL models in Keras for recognizing product logos in images and extracting sentiment from text. You will then take that trained model and package it as a web application container before learning how to deploy this model at scale on a Kubernetes cluster. You will understand the different practical steps involved in real-world ML implementations which go beyond the algorithms. If youre ready to learn about one of the most popular DL frameworks and build production applications with it, youve come to the right place! DATTARAJ JAGDISH RAO is a Principal Architect at GE Transportation (now a part of Wabtec Corporation). He has been with GE for 19 years working for Global Research, Energy and Transportation. Currently, he leads the Artificial Intelligence (AI) strategy for the global business, which involves identifying AI-growth opportunities to drive outcomes like Predictive Maintenance, Machine Vision and Digital Twins. He is building a Kubernetes based platform that aims at bridging the gap between data science and production software. He led the Innovation team out of Bangalore that incubated video Track-inspection from idea into a commercial Product. Dattaraj has 11 patents in Machine Learning and Computer Vision.